Britain has spent over two years negotiating a settlement with the EU, not by negotiating with the EU, or even with itself, but in the form of an undisguised, acrimonious argument conducted solely within the Conservative Party. With little time now left for Britain to prepare for exit in March, 2019; to scale-up the customs and borders resource, or to develop the missing depth and scale of expertise in our Civil Service to match the expanded regulatory requirements that follow from Brexit (because the EU provided our expertise worldwide), and with no significant contingencies arranged, or resources committed, the Conservative Government has failed to produce even a commonly agreed Plan within the Cabinet; still less within Government, still less with Parliament or people. 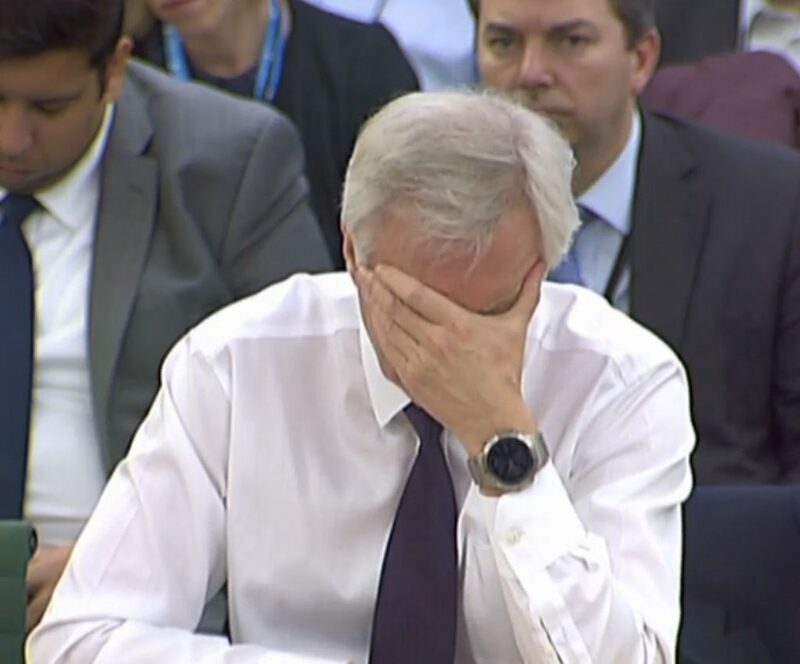 We have no Plan, and if Theresa May’s supposed ‘Plan’ can scarcely survive a week-end debate within a conclaved Conservative Party Cabinet; if such a ‘Plan’ is ever presented to the EU, it would be unlikely long to survive serious scrutiny there. Lacking a ‘Plan’, the only stark alternative becomes more likely; and that is a sudden, precipitate British exit from the EU on the proposed date – with no deal: nothing, or as it is popularly known by those over-eager for an international trade struggle they know little about; a ‘hard Brexit’. Some Brexiteers will welcome this; the more cynical commentators may speculate that this was the Hard-Brexiteer ‘Plan’ all along: knowing that Parliamentary prevarication, political bullying and internecine disruption of Government on the back-benches of the Conservative Party, if effectively applied for long enough, could produce just this result: leaving Britain with neither the time nor organisation to do anything else in the EU departure timeframe unfortunately and deliberately chosen by our careless Government. If that happens we will have no option but to ‘fall-back’ on WTO rules; rules that naive, ill-informed British voters, seduced into voting for Brexit, will soon find does not provide the fast, free open world they believe is within reach; like ripe, low-hanging fruit. How bad do you think this is? It is worse. We may never fully understand why 52% of votes in the Referendum voted in favour of Brexit; and we should not forget that 52% for Brexit was not 52% of voters, but rather of those who voted; Brexit (an ‘advisory’ Referendum that did not define precisely what ‘Leave’ actually meant) was passed by a vote of only 38% of the total electorate. Nevertheless, what we are now seeing unfold in Britain is not wholly inexplicable, or particularly new; or even surprising. Perhaps it was inevitable all along. I might argue here that what we are seeing is a display of the hidden reality of the Conservative Party; a determination to stay in power, or at least in office, no matter the consequences: but it goes deeper than that. The case made by the Cameron government, and of both sides in the Referendum Campaign was, at best a vulgarity. The Referendum Campaign took the operation of public disinformation to refined levels of mendacious destruction of meaning: and as a result we have cynically disinformed ourselves. I consider both Referendum campaigns (and both notably led by the Conservative Party – ‘heads-we-win-tails-you-lose’) guilty. Facts were ‘spun’; in our culture anything may be massaged in the media to mean almost anything at all: black is white; right is wrong; the mainstream media never produce or repeat ‘fake news’ (what precisely do you mean by ‘fake’, or by ‘news’?). Our personal data is toyed with, our identities and preferences become the playthings of the 21st century digital toolbox, in the hands of the politically savvy. Unfortunately the desire by ‘authority’ in Britain to misinform the public for political advantage is endemic, but its enthusiasm for the activity has not quite kept pace with modern, international culture and personal technology: hence the British public now know they cannot believe anything, they cannot trust anything, and they cannot trust anybody. Nevertheless with Brexit, Britain is destined to revisit an anachronistic past we would have better left behind. Brexit means Brexit, a slick choice of words (a tautology presented as synthetic illumination). Brexit is a deliberate, ideological catch-all, much of it with a long and pernicious intellectual history in Britain. After WWII Britain could have taken the lead in forming the Coal and Steel Community (1948). We didn’t. We could have written much of the Treaty of Rome (1957). We didn’t. The Treaty of Rome, written by the six founding nations of the EEC promised, in large print, right up-front “ever closer union”. We didn’t read it. We didn’t care. Britain only joined the EEC in desperation in 1973, because we thought it had succeeded post-war, precisely where we had failed, in the economy; most notably with EFTA, Britain’s forlorn, blustering answer to the EEC; which we promptly left when the prospect arose of joining the EEC. We did not join a fixed ‘Common Market’; we joined an established community that had made it abundantly clear from the beginning they were on a long journey toward closer European Union. The British only care about what they want. The deception of the British people that this was just a ‘Common Market’ was simple self-deception. The only people we can blame for that is ourselves (politically, and ironically, if the blame may be pointed at anyone, it is the Conservative Party, who pushed it through). The problem is this. Britain did not join the EEC-EC-EU in sincere acceptance of its objectives, and it has been the most profoundly insincere member ever since. All Britain’s efforts in the EU over almost fifty years have been to negotiate itself out of as much of the community rules that it can (Euro, Schengen, rebates, and on and on); and has often found agreement from its tolerant partners. In retrospect it seems more realistic to believe that Britain joined the EU rather to disrupt its purpose and gerrymander its development than commit to membership. Perhaps it thought it could reduce the EU to EFTA Mark II; but at least to end the prospect of closer Union. Britain has certainly been a force for disruption in the Community. The only real involvement Britain has embraced in the EU, outside negotiating special privileges for itself, has been aggressively to promote expansion of the EU at the fastest rate possible; an argument it won against the greater caution of the original mainland EU states. We began with six; it grew to 28, and for the first time ever, it will lose one member when we leave. We do not care. I have little doubt that the British policy purpose was not to further the vision of greater union, or the interests of the EU, but the opposite: to make it more difficult to achieve the EU’s ends; a kind of gerrymandering through expansion: development is slowed, the problems of assimilation escalate, the prospect of internal EU division is exacerbated. It is striking to me that when the consequences of that policy of rapid expansion has now run into difficulties consequent on the fast assimilation of relatively underdeveloped countries into the EU, and the political tensions that could be predicted, Britain is swift in condemnation of EU policies on immigration (often from these same countries); and now wishes to walk away from the EU altogether, and leave it with the problem to solve. It is a wretched record. All these factors express to me a latent insincerity in British membership of the EU that has now surfaced in an extremely unsavoury way. Brexit is not a new idea for Britain, indeed it is the core faith of British exceptionalism; and within it is the very old ideology of British ‘reason of state’ politics. Beside this, Hobbesian statecraft was benign. We seem unable to rid ourselves of the ideological anachronism of representing Europe as the permanent, imminent reification of ‘Universal Monarchy’; itself a cloak for something enduring and dangerous: British geopolitical hubris. Brexit means Brexit. Let me take just one example of what Brexit means Brexit entails. It implies not just leaving the EU, but undermining it, for that is what inevitably follows: the seductive idea that there is an alternative now open for European states, to membership of the EU. Be in no doubt. Britain will encourage others to follow where Britain leads, directly or indirectly; officially or unofficially. Brexit implies, indeed desires a return to a divided Europe, but without stating the ‘end-game’ for all to see; in which Britain can return to a leading role in ‘Balance of Power ‘politics, playing one state’s interests off against another. We have had a dry run of this with Brexit, in Britain’s attempts to divide the 27 among themselves, in British negotiating interests – and so far failed. The tragedy of this is that the policy is precisely the same British approach to international politics in Europe that Britain pursued for the previous two hundred years; which ended so catastrophically for everyone in the 20th century, in two World Wars. Never again. Lest we forget. Lest we forget? It is 2018; and we have already forgotten. Brexit has one rational objective, that’s keeping the City’s offshore racket out of reach of Brussels. That’s why the avuncular Boris’s resignation letter said a soft Brexit was worst of both worlds. A clear admission there is a big trade off and big pay off; the pay off exists from the cabal’s point of view. It’s what’s behind code about “sovereignty”. The Brexiteers are Machiavellian but appear stupid while the Lexiters are stupid but appear Machiavellian. Lexit sentiment undermining opposition has, however, been integral to the plan from day 1. Well said John,I agree totally with what you say. May’s pathetic attempt at undermining EU solidarity on Brexit by visiting individual heads of state and apparently asking Angela Merkel to “Make me an offer”. Things are coming to a head now,not only with Brexit but through Trump’s demand that Europe shoulder more of the NATO responsibilities and Merkel stating that we can no longer rely on the USA to keep the peace. Where does that leave the UK’s “independent” nuclear deterrent and also where will it take the lead from,Europe or the USA? This type of argument is flimsy. Whoever doesn’t vote supports the outcome fair and square, whatever it is. If you did not vote (other than for reasons of conscientious abstention), you supported Brexit on merit of the result, period. And using “we” in conjunction with British is something that I consequently avoid. My sense of Britishness has been deconstructed over the last years, and although I am a British passport holder, British I am no longer, thus my use of the term “they” in reference to “British”. This is an important starting point for independence, and we should foster it at a linguistic level if we believe Scotland should indeed be separate. I do not subscribe to the view that critical constitutional changes in a mature democracy should be passed by a very small, simple majority. We managed to find a wiser solution for critical, deeply divisive constitutional issues in the 18th century. Madison ensured that a simple majority could not be used to change the American Constitution; a principle now genrally followed by sophisticated, advanced democracies. It is irresponsible to rely on a bare majority (50% + 1 vote), because small majorities for critical constitutional changes, that effectively cannot subsequently be changed (or changed in a viable timeframe) are potentially unustainable and politically highly destructive of unity and stability. It happens because simple-minded people confuse democracy with electoral dictatorship. Brexiteers consider the EU dictatorial, but the Brexiteers, quite mindlessly, wish to deprive almost half the country of their long-held and deeply valued European political rights, on a narrow majority; and that is dictatorial. Such draconian changes should require substantial majorities before they can be implemented; Brexiteers are advocating electoral dictatorship. We already have experience of a test for a constitutional change in Britain with a test of the majority, within British constitutional history. We already have the precedent. It has been lost. In 1979 the first Scottish Devolution Referendum required 40% (of total electorate) to vote in favour. A majority voted Yes, but it failed to pass the 40% test; the Referendum fell. In 1999 the Scottish Devolution Referendum had no test, but the decision was decisive (75% of votes in favour: 45% of total electorate – passing the test easily). Unlike the EU Referendum the losers in Scotland in 1999 were soundly defeated and had no grounds for challenging the depth of support in Scotland for Holyrood. In the EU Referendum, the winners only reached a comparable 52% in favour of ‘no’: only 38% of total electorate – it failed the test. The political mess we are now in, and the deep divisions and rancour that have been created were foreseeable and inevitable: it is a complete, shambolic mess. And be in no doubt: a 2nd Scottish Referendum will now require only 50% + 1 vote. Nothing else is sustaianble now. The lesson for Brexiteers? Beware what you wish for……..
have listened to the lady and her various assurances given in the House. no matter which side you are on, it now seems to me (and no doubt many others) that Theresa has sold the jersey. We are drowned in conflicting stories about Brexit. Many people have no real idea of what is happening. This piece, if you read it through to the end, seems to be well founded and gives a reasonable view into the future.